Indian world traveler Somen Debnath met the Director of United Nation Information Centre of Bahrain Mr. Najeb Friji at the United Nation House yesterday. Thrilled with his campaign of Spreading AIDS awareness across the globe the UN Director promised to write about Mr. Debnath to the United Nation to support his noble cause and ease his travel from country to country. “Awareness of AIDS/HIV is not just important but Human Rights to every human being and I’m glad that Mr. Debnath took the initiative to spread it.”, said Mr. Friji appreciating the young traveler. 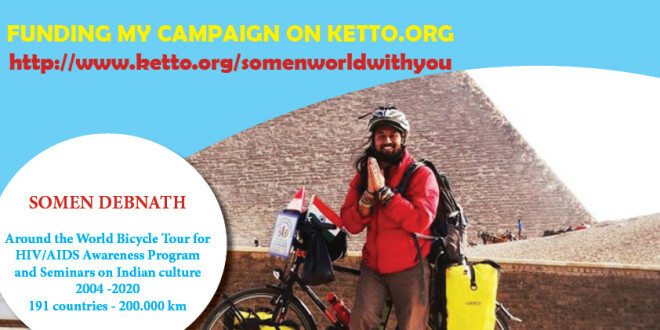 Somen Debnath having travelled for 2500 days, reached Bahrain two weeks ago making it the 80th country he visited. “You are the messenger to the rest of the world where we cannot reach out and carrying the UN Global message regarding AIDS/HIV you are doing a wonderful job. You are encouraging and backing the UN which makes me proud of you.” wrote Mr. Friji as he signed off a poster for Mr. Debnath.